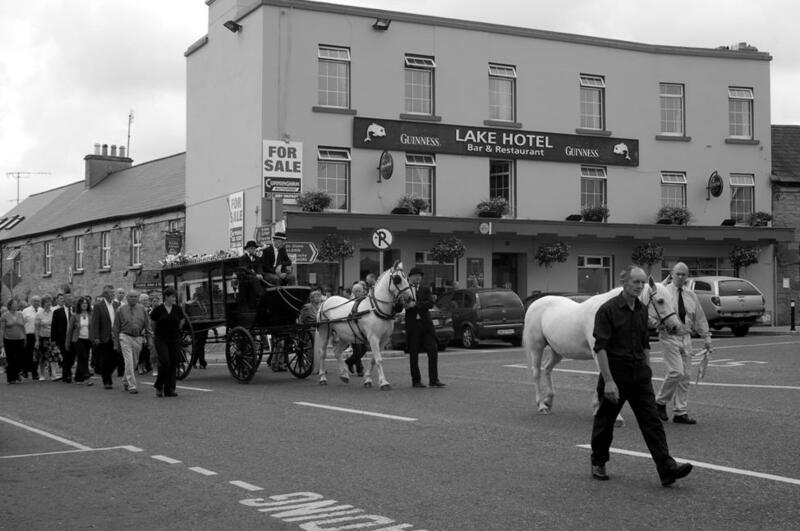 The members of the Oughterard Show Committee were greatly saddened to hear of the untimely death of Show President, Sean Conneely. Sean was also a former chairman of the Show Committee and continued to be an active member and supporter of the Show Society. 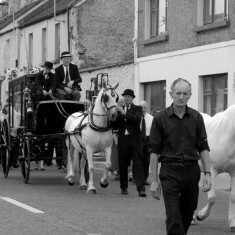 He was a life-long breeder of Connemara ponies and, over the years, he won many first prizes for his mares and foals at local and regional shows. 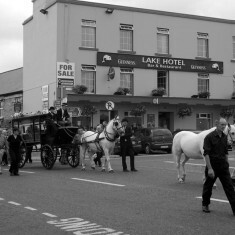 He took great pride in displaying trophies and rosettes in the window of his home on the main street in Oughterard. 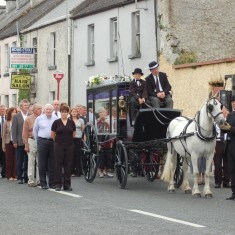 Members of the Show Society provided a guard of honour at the removal from Oughterard Funeral Home to the Church of the Immaculate Conception on Wednesday evening. 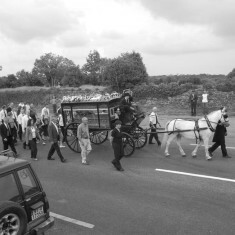 The funeral Mass took place on Thursday 20th at 12 noon and it was a fitting tribute that Seán’s last journey to the cemetery at Kilcummin was made by way of horse drawn hearse. 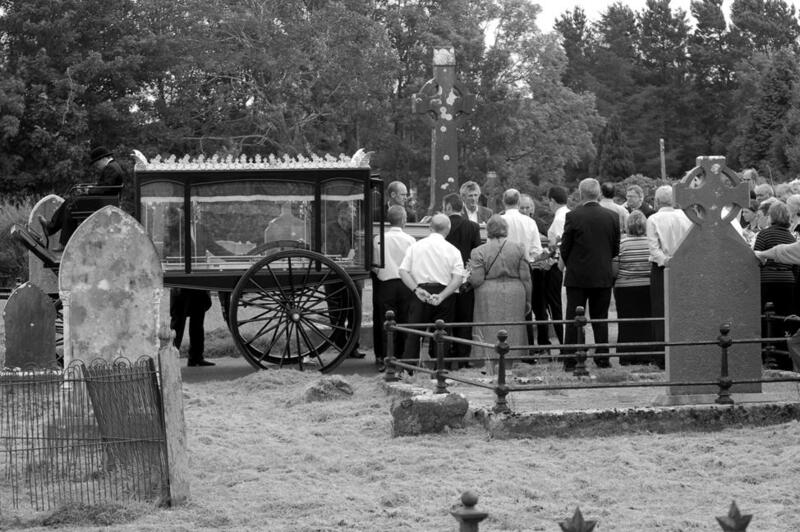 His father had owned such a hearse in the 1940s and, as a boy, one of Sean’s responsibilities was to clean and polish it whenever it was called into service. 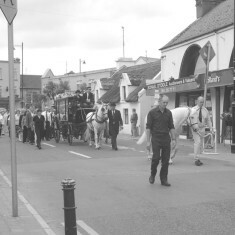 Around 1975, it was purchased by local pony breeder Paddy Geoghegan who carefully restored it. 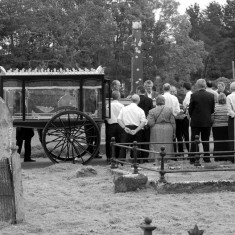 Unfortunately, that old hearse could not be used on this occasion as more than a day’s work is required to soak the wooden wheels in order to ensure that the iron tyres fit tightly to the wood. 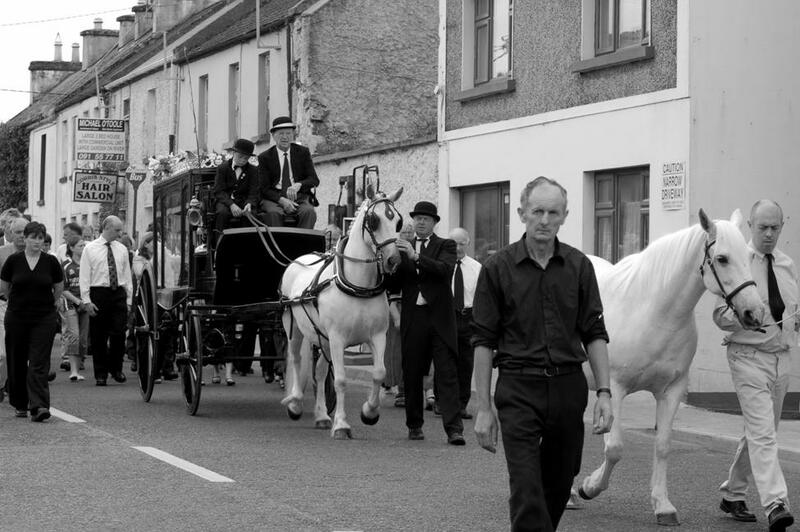 The Oughterard Show Society extends its deepest sympathy to Seán’s four sisters, Fideles, Norah, Teresa and Pauline and to his nieces, nephews and cousins and extended family. 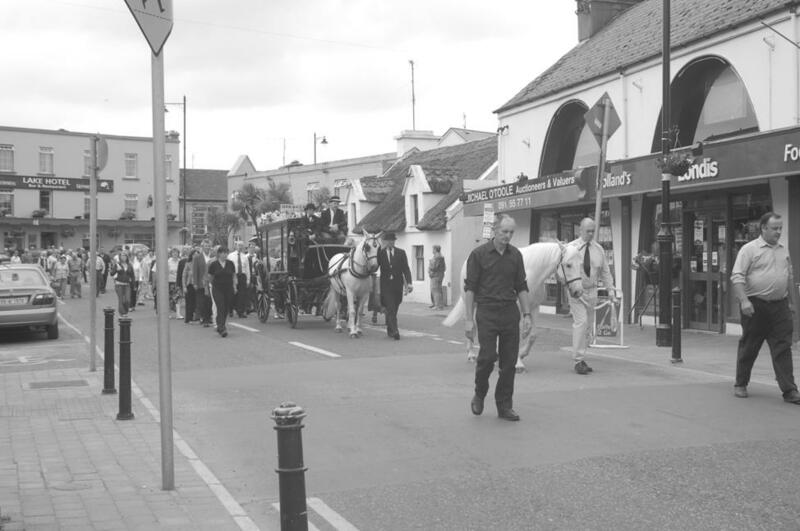 Seán was also a great supporter of the GAA both at local and county level and a flag could always be seen flying from the window of his home whenever the Oughterard or Galway teams were involved in a match. 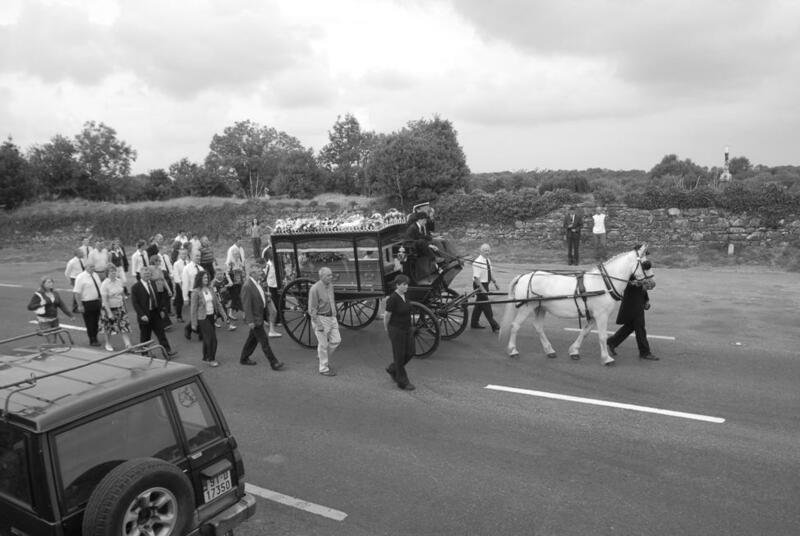 He will also be remembered for his graceful movement on the dance-floor but above all for his warm friendly personality, his willingness to provide a hackney service at most unsocial hours and especially for his helpfulness to those visiting his shop and filling station on Main Street. 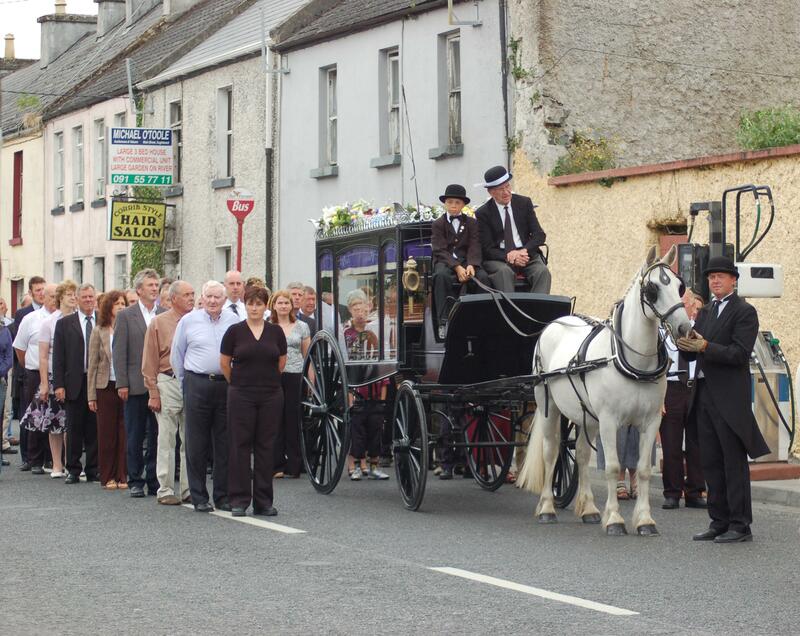 Seán will be greatly missed by many friends in Oughterard and the surrounding area.